All Patti Murray wants is to marry a fine, God-fearing man—hopefully one who is tall, dark, and handsome. In this Christian romance, Patti must choose between the handsome, glamorous actor and the hometown doctor. 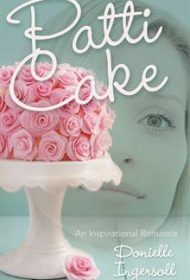 Patti Cake, like the name suggests, is, in many ways, a childlike romance. The three main characters—Patti, actor Jim, and doctor Cal—have a naive fixation on one goal: getting married. The protagonist is nicknamed Patti Cake for her reputation as the finest cake baker around. Patti and Cal, in particular, struggle with vices such as swearing, drinking alcohol, skipping devotions, and having impure thoughts, but are always quick to ask for God’s guidance so they don’t tumble down a slippery slope. Meanwhile, Jim simply desires a wife that he can keep “in bed until she gets very pregnant,” despite his glamorous, jet-setting lifestyle. But would he be faithful to the end? Details about Patti’s baking skills comprise some of the author’s best writing, and readers will enjoy her recipes included at story’s end. In addition, Patti’s klutziness around Cal—i.e. accidentally showering Cal with flour followed by pickle juice—gives the book some humor. Occasionally, though, the writing is odd, as when Jim is called “Jim from the movies.” (Would we call Tom Cruise “Tom from the movies”?) Equally odd, Jim falls in love with Patti Cake based solely on her picture on the Internet and had past girlfriends break up with him over the water temperature in the shower. Given the list of vices Patti and Cal struggle to avoid, this book seems aimed at a conservative audience. However, one plot twist—when Patti seduces her chosen man before marrying him—risks alienating those readers. The author does give a nice plot turn at the end that explains Patti’s decision. Despite the flaws mentioned, this is a cute, sweet romance. Seduction plot twist aside, its most likely audience will be conservative Christian women.